The focus of this blog is the Red Pepper Sauce. Though the Wild Char was so good it actually was the highlight of the dinner. In my continuing search for compatible combinations, the Char and the Red Pepper Sauce took high honors. And the spicy salty Capers offset the sweetness of the Sauce. I love to experiment, especially when it turns out to be a pleasant surprise. 1. Heat the EVOO in a large saucepan. Add Garlic & Onion. Sauté until tender. Add the diced roasted Red Pepper, Tomato Paste & Thyme. Cook mixture for 2 minutes, stirring constantly. Add Vermouth or White Wine, bring to a boil. Boil for 1 minute. Add the Chicken Broth, bring it to a boil. Boil until sauce is reduced by almost half. Add Heavy Cream, simmer until reduced again by about half. Remove from heat; pour into blender container. Puree until smooth. Season with Salt to taste & put through a sieve to strain (only if desired). 2 To serve, spoon the Red Pepper Sauce on the plate, top with the Char & surround with the Capers. 2. Season the Char. Heat a cast iron pan to high. Add the 2 pieces of fish, weighed down with a grill press for 2-1/2 minutes on the skin side. 3. Place in the oven & bake for 5 to 7 minutes, (depending how well done you prefer). 4. 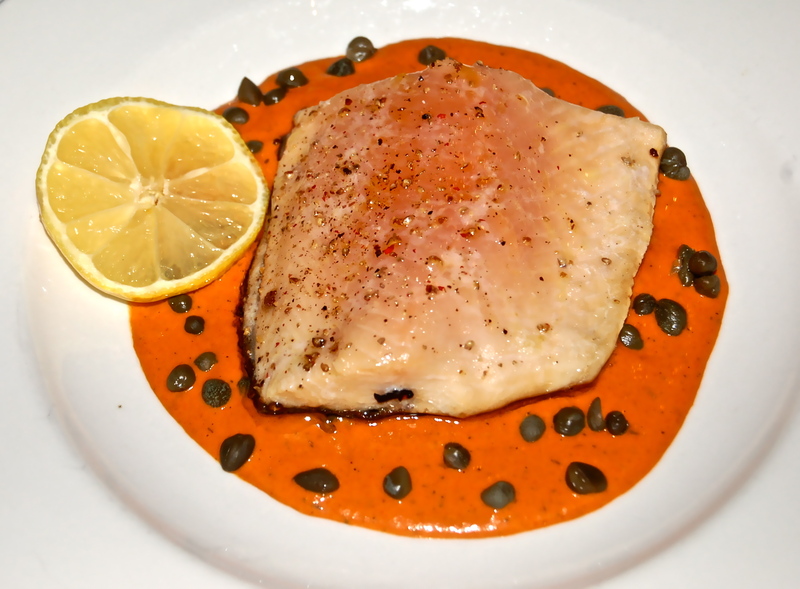 Plate with the Red Pepper Sauce, Capers & serve.